Weight loss surgery including the Gastric Bypass and Sleeve Gastrectomy, has received a great deal of recent scientific support in relieving patients from symptoms of Type 2 Diabetes. In some cases, they have even induced long-term remission. Southeast Florida’s bariatric surgeon, Dr. Kahlil Shillingford, provides highly personalized care, private pay all-inclusive packages, and behavioral/nutritional support. Perhaps a few of the reasons his patients seek him from as far away as Daytona Beach, Naples, and Orlando, Florida. Over the years, it has become evident that bariatric surgery not only provides a tool for treating chronic obesity, it also address comorbidities such as hypertension, high cholesterol and, of course, diabetes. Over the last weeks our blog has been featuring diabetic superfoods who have been studied for their nutritional profile and possible effects on lowering insulin resistance in diabetics. To close this series we pay homage to the American Diabetes Association approved Winter produce that is abundant this time of year. One of the benefits of this diabetes powerhouse is that it is locally cultivated here in the United States. Other countries producing the world’s cauliflower supply include France, Italy, India, and China. 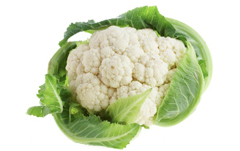 When purchasing cauliflower, look for a clean, creamy white heads that are surrounded by many thick green leaves which are better protected and will be fresher. Since cooking causes cauliflower to spoil quicker, consume it within two to three days of placing in the refrigerator after cooking, or better yet, enjoy it raw. The nutrient profile of cauliflower is an impressive one. Not only is it an excellent source of vitamin C, vitamin K, and folate, it is also rich in B vitamins, potassium, dietary fiber, manganese, protein, phosphorus, magnesium, and iron. Lastly, it contains key antioxidant phytonutrients such as beta-carotene, beta-cryptoxanthin, caffeic acid, cinnamic acid, ferulic acid, quercetin, rutin, and kaempferol. All of the above lead to the support of three of the bodies most important defenses. These three systems are the body’s detox system, its antioxidant system, and its inflammatory/anti-inflammatory system. 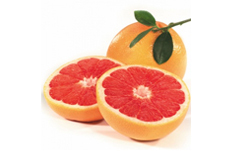 Research supports that grapefruit may help prevent weight gain and diabetes by lowering insulin levels. Also local to the United States, the great majority of grapefruit is actually produced right here in Florida. Other countries that produce grapefruits commercially include Israel, South Africa and Brazil. Grapefruits should be firm, yet slightly springy when gentle pressure is applied. They are usually eaten fresh by slicing the fruit horizontally and scooping out sections of the halves with a spoon. To separate the flesh from the membrane you can either cut it with a sharp knife, a special curved-blade grapefruit knife, or a serrated grapefruit spoon. Although Kale originated in European continent, cultivation has spread widely and it is now grown in nearly every climate with a preference for cooler temperatures. Look for kale with firm, deeply colored leaves and moist hardy stems.To store, place kale in a plastic storage bag removing as much of the air from the bag as possible. Store in the refrigerator where it will keep for 5 days. The longer it is stored, the more bitter its flavor becomes. Due to high pesticide use in its cultivation, organic options are always best. To get the most health benefits from kale, let sit for a minimum of 5 minutes before cooking. Sprinkling with lemon juice before letting them sit can further enhance its beneficial phytonutrient concentration. Steaming is the preferred cooking modality for this tender green. 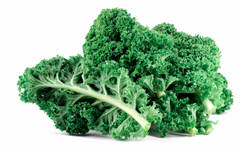 Kale is rich in antioxidant and anti-inflammatory nutrients vitamin C, beta-carotene, and manganese, and flavonoids, including kaempferol. It is also high in Vitamin A, B, C and K, much-needed micronutrients lacking in the typical Western diet. Lastly, it contains cancer-preventive nutrients called glucosinolates. Dr. Kahlil Shillingford is a board certified surgeon who specializes in bariatric or weight loss surgery including the Sleeve Gastrectomy (Gastric Sleeve), Gastric Bypass, and Lap-Band procedures. His patients come from across the state of Florida including Naples, Miami, and Daytona Beach. To learn more about Dr. Shillingford’s integrative weight loss surgeries and all-inclusive fees please call his office in Boca Raton, Florida at (561) 483-8840.